“Sunset Under Pier” by Chad Hunter. Watercolor. First Place, 2016. It’s hard to visualize Capitola being more picturesque than it already it is…until it is seen through the creative eyes of an artist. The first weekend in November, Capitola’s environment becomes the inspiration for local and regional artists highly skilled in painting scenic natural beauty and small city charm. The public has the opportunity to view many of these artists in action when the annual Capitola Plein Air returns for its third annual paint out event. 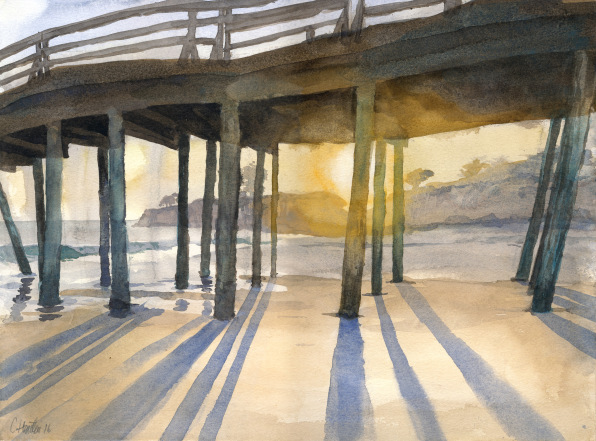 Facilitated by the City of Capitola Art & Cultural Commission, Capitola Plein Air is a juried art competition, exhibition and sale. 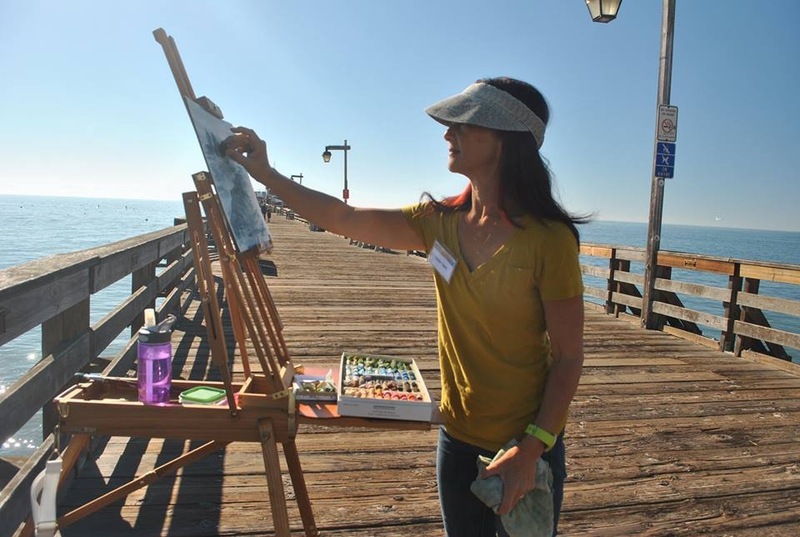 The free event features dozens of professional and amateur artists painting citywide impressions throughout Capitola, New Brighton Beach, Depot Hill, the Esplanade and the Jewel Box. Stroll through these vibrant beachside landscapes and watch Capitola take form on canvas in various mediums as artists paint “en plein air”. En plein air is a French expression meaning “in the open air”, and is particularly used to describe the act of painting outdoors. Outdoor artists are familiar with certain challenges, such as carrying their equipment to unusual and sometimes uneven painting sites, painting quickly to capture the changing light, and working around unpredictable weather conditions. 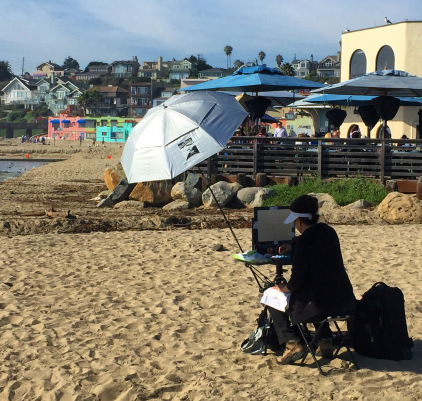 For the past several years, the Capitola event has gathered plein air experts using oils, pastels, and watercolors to imaginatively reflect local ocean, beach, and village life. You may come across these talented artists and their easels as early as November 1-3, but the painters will be busiest on Saturday, November 4th from 10-2, when all competing artists are required to paint. On Sunday, November 5th from 11-4, more than 100 framed paintings will be on display and for sale at the Plein Air exhibition, competition and sale in New Brighton Middle School. All visitors are invited to participate in the competition by voting for the People’s Choice Award and celebrating the other top prize award winners. 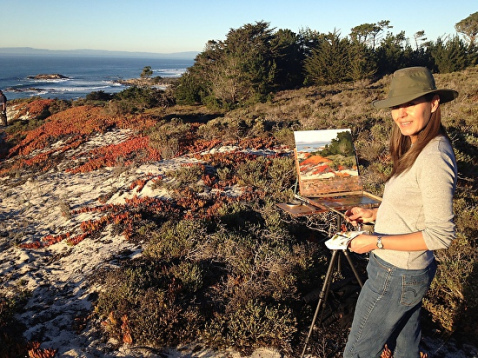 Artist Laurie Kersey will judge the works at Capitola Plein Air 2017. Forty artists have been juried into the competition this year and will be judged by award winning landscape and plein air painter, Laurie Kersey. Purchasing their beautiful work also supports the community – a portion of the art sales will benefit local art education. Admission to the Sunday event is free, and also includes an Art Pop Up Tent with hands-on art-making activities with Linda Cover of Watershed Arts, local food, and live music by Marc Schwartz & Dale Mills.